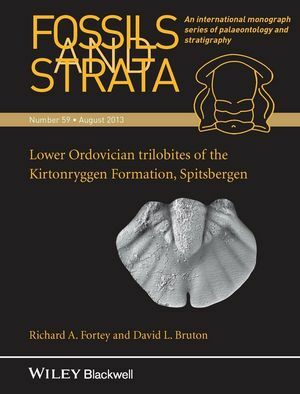 This monograph describes early Ordovician (Ibexian:Tremadocian–early Floian) trilobites from Northern Spitsbergen from the section through the Kirtonryggen Formation adjacent to Hinlopen Strait. The Formation is divided into three Members, each with distinct trilobites collectively representing the fullest known succession from the Bathyurid biofacies of the eastern Laurentian carbonate platform. Previous research on the Ordovician of Spitsbergen is summarised and correlations with similar faunas previously described from Canada, Greenland, western Newfoundland, Vermont–New York State, Oklahoma and Missouri are discussed. Taxonomic problems are discussed in detail leading to the recognition of 53 species, of which 15 are new, belonging to 31 genera including four new. Twenty-four taxa are described under open or tentative nomenclature. The lower Member yields the earliest known occurrences of the Illaenoidea, Proetoidea and Scutelluoidea, supporting the hypotheses relating the origin of new major clades to inshore habitats.